Fall foliage at Saddleback Lake. 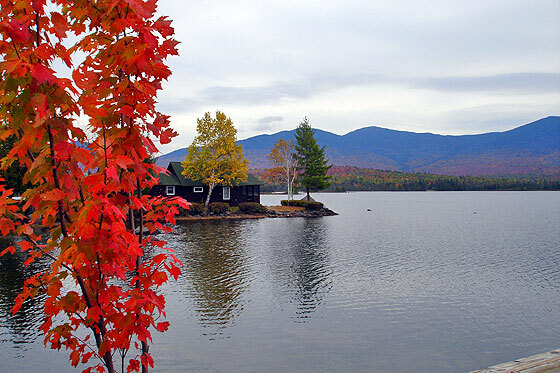 Peak Foliage season in the Rangeley Lakes Region takes place anytime between late September and early to mid October. Weather conditions are key in determining the intensity of foliage color, with the primary factors being temperature and moisture. Ideal conditions are a warm, wet spring, good summer weather, and a warm, sunny fall with moderately cool evening temperatures. A late spring or severe summer drought can delay the onset of the foliage season. An unusually warm fall will produce subdued color intensity in the foliage. Leaf colors are typically grouped in these four categories: BROWNS: Black and White Oak; PURPLES: White Ash and Witch Hazel; REDS AND SCARLETS: Hornbeam, Red, Mountain & Sugar Maple and Black, Red, Scarlet & White Oak; YELLOWS: Green & Black Ash, Basswood, Beech, Birches, Butternut, Elm and Maple (Boxelder, Mountain, Silver, Striped & Sugar), Mountain Ash, Poplar, Serviceberry, Willow and Witch Hazel. For updates on where to view peak foliage, visit the state’s website: mainefoliage.com or call the state’s Tourism’s Fall Foliage Hotline from mid-September through October at 1-800-533-9595.